Two men have pleaded guilty to an arson attack on a mosque in Gloucester in June. 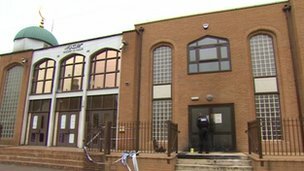 Petrol was poured around the door of the Masjid-E-Noor mosque on Ryecroft Street and set on fire in the attack. Clive Ceronne, 37, of Redwood Close, Gloucester, and Ashley Juggins, 20, of Brooklyn Road, Cheltenham admitted arson with reckless endangerment to life at Gloucester Crown Court. The pair are due to be sentenced on 18 November.